1. Stream reaches found to be impaired by physical, chemical or biological assessment generally are associated with greater extent of urban and agricultural land uses, and lesser amount of undeveloped lands. 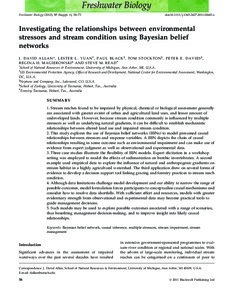 However, because stream condition commonly is influenced by multiple stressors as well as underlying natural gradients, it can be difficult to establish mechanistic relationships between altered land use and impaired stream condition. 2. This study explores the use of Bayesian belief networks (BBNs) to model presumed causal relationships between stressors and response variables. A BBN depicts the chain of causal relationships resulting in some outcome such as environmental impairment and can make use of evidence from expert judgment as well as observational and experimental data. 3. Three case studies illustrate the flexibility of BBN models. Expert elicitation in a workshop setting was employed to model the effects of sedimentation on benthic invertebrates. A second example used empirical data to explore the influence of natural and anthropogenic gradients on stream habitat in a highly agricultural watershed. The third application drew on several forms of evidence to develop a decision support tool linking grazing and forestry practices to stream reach condition. 4. Although data limitations challenge model development and our ability to narrow the range of possible outcomes, model formulation forces participants to conceptualise causal mechanisms and consider how to resolve data shortfalls. With sufficient effort and resources, models with greater evidentiary strength from observational and experimental data may become practical tools to guide management decisions. 5. Such models may be used to explore possible outcomes associated with a range of scenarios, thus benefiting management decision-making, and to improve insight into likely causal relationships.